I have been obsessed with this dress ever since I laid my beady little eyes on it on the Lavish Alice website not so long ago - and wearing it to fashion week but pretty much be a street-style dream! Not to mention how aweeeesome it would look with my new Nightwalks! Pretty much dying over the cat-eye shades aswell, how beautifffful! Since i'm pretty much a wear-what-you-want kinda gal, that was the only inspiration behind this. I want to wear this dress and keep it forever! 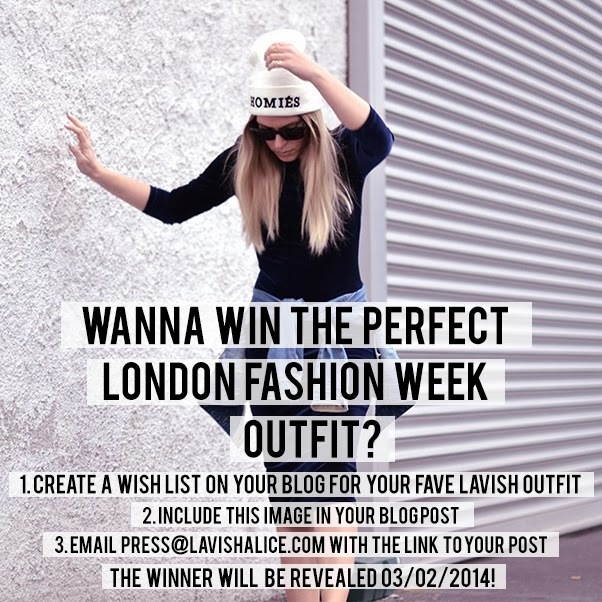 I'm so excited for Fashion week this year and i've been outfit planning crazy, so I figured why not take part in what Lavish Alice have going on - the Fashion week comp! You can find out more on their blog, which the image below is linked to if you're interested! It's so easy, I thought i'd fall over but the balance is fine! And don't think negatively, just apply for some you never know! YES I have to get my hands on it! That dress with those shoes is definitely fashion week style :) Have a great time there! Thank you! I will, i'll blog all about it!